American and Okinawan artists, taking inspiration from the contrasts and contradictions of Okinawa, will be displaying the best of their aesthetic creations this weekend at the Plaza House Shopping Center. 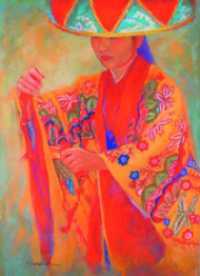 The Artists Guild of Okinawa, currently comprised of 12 artisans, will offer their best works in various mediums for sale and for the enjoyment of visitors who attend the free East Meets West art show. The show begins on Saturday, from 10 a.m. to 8 p.m., and continues on Sunday from 10 a.m. until 5 p.m. Works will be displayed on the open-air, second floor area of the Plaza House located on Hwy. 330 close to the Awase Golf Course. 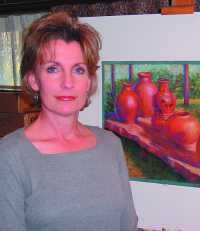 One of the artists, Teresa Chandler, spoke about the different mediums that will be represented at the show. “There will be oil, pastels, pencil, watercolor, photography and pottery,” she said. 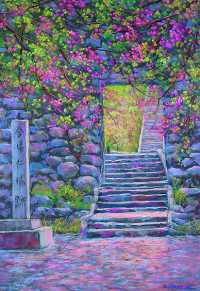 “Most of the artists, as I do, focus on the scenery of Okinawa, natural settings as well as the people.” Chandler now uses pastels exclusively for her art after beginning and working for several years in oil paints. “I prefer the impressionistic aspect of art and the pastels, which are dried pigment, allow me to simply select the color I want, and to be able to use it right away instead of first mixing the colors as you have to do with oil paints,” she explained. “I find pastels to be a fun medium.” She also said the vibrancy of the colors found in everyday life here translate well with the richness of her preferred medium. Besides traditional art that has been applied to canvas, the art shows taking place underwater each day have been captured and brought to the surface by photographer and scuba-diving aficionado John Chandler. His underwater photographic pieces will be on display already framed and ready to hang. For more information on this year’s only East Meets West art show, contact Mary Breshike at 633-1587.